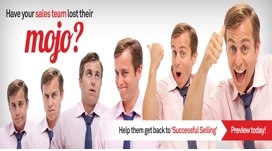 This program is a fast-paced, practical video guide to sales for sales professionals. Using realistic scenarios and featuring recognizable actors it covers six modules for successful selling; research, objectives, asking questions, explaining benefits, meeting objections, and selling techniques. In Successful Selling, Alex, an experienced sales professional gets sucked into his online sales training app. As his virtual guide, Buddy takes him through a series of selling simulations, Alex realizes that perhaps his technique isn’t as sharp as he thought.